The 5K course is a 3.1 mile USATF IL-08046-JW certified course that starts on Dupont Avenue in front of White Oak Elementary School and winds through residential neighborhoods. The Wellness Walk takes place on the same course.The Tot Trot (8 & under) is located in the field behind White Oak School. Overall: Awarded to the top 3 males and females. Tot Trot: Participants will receive a medal. Long Sleeve Dri-Fit Shirts will available for the 5k Run/ Wellness Walk. Shirts will be available to the first 350 pre-registered participants. Long Sleeve Dri-Fit shirts are only available in adult sizes. Tot Trot participants will receive a cotton T-shirt. Tot Trot shirts are only available in youth sizes. 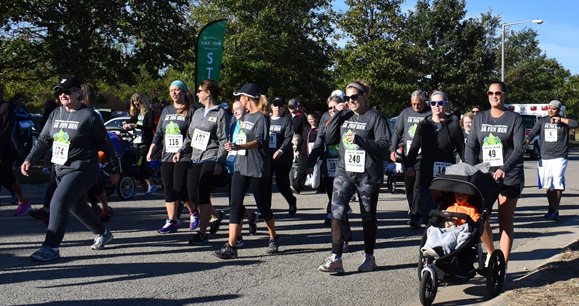 Pre-registered participants may pick up their race packets at Morris Hospital on Thursday, September 27, 2018 from 3:00 p.m.- 5:00 p.m. (come to the main entrance and follow signs), or on race day at White Oak School from 7:30 a.m. - 8:45 a.m.